Frederick Muller, 1959, Hardback in Dust Wrapper. Condition: Very Good - in Very Good DJ. Unlaminated DJ a little edgeworn and faded. Leans slightly. Edges of the textblock spotted. 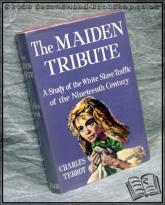 A frank and grimly fascinating documentary account of the white slave traffic of the last century. Basing much of his account on hitherto unpublished facts, Mr. Terrot shows with vivid and often horrifying detail how the export trade in young girls from Britain reached a peak which eventually shocked and rocked the whole nation. Size: 8" x 5¼". 230 pages.